In this paper, we discuss how we are extending the Preschool in Three Cultures studies in a new direction. We present summaries of three recently published studies: The Japanese Preschools Pedagogy of Feeling; The Japanese Preschool’s Pedagogy of Peripheral Participation; and Reframing a Visual Ethnography of a Japanese Preschool Classroom, and we describe our latest research on a deaf kindergarten in Tokyo. We use these studies to argue for the importance of implicit cultural beliefs and practices. Most discussions of best practices for early childhood education are based explicitly or implicitly on theories of child development. Our position is that while knowledge of child development is necessary for informing practice, it is not sufficient. In addition to having knowledge of childrens biological, intellectual, and emotional development, early childhood education practitioners, policy makers, and researchers need also to pay attention to sociological and especially to cultural factors. The field of early childhood education and care should be a site for the meeting and interaction of psychological, biological, sociological, and anthropological theories and perspectives. In this paper we argue for the importance of attending to what we call each nations portfolio of implicit cultural beliefs and practices about early childhood education. Preschool in Three Cultures: Japan, China and the United States was published in 1989 and Preschool in Three Cultures Revisited: China, Japan, and the United States, in 2009. In the two years since the new book was published we have extended the study in several directions. The Psin3C studies are of teachers in three countries. Our follow up research is more focused, as we explore in greater depth Japanese preschool teachers beliefs about how to best support childrens social-emotional development. In each of our new studies we use the videotapes of typical days at Komatsudani Hoikuen and Madoka Yochien as tools for conducting interviews with Japanese preschool teachers and directors. In this new research instead of, as in the original studies, showing our informants the whole 20 minute videos, we ask them to watch and comment on specific scenes in the videos that feature teachers in some way scaffolding childrens social-emotional development. In our paper The Japanese Preschools Pedagogy of Feeling (Hayashi & Tobin, 2009), we focus on moments where children and teachers express emotions in the videos of typical days at Komatsudani Hoikuen in Kyoto and Madoka Yochien in Tokyo. For example, when we re-interviewed Morita-sensei about the scene in the Komatsudani video where we see girls fighting over a teddy bear, she emphasized how the youngest girl in the class, Nao-chan, who initially grabbed the bear and then cries when the older girls take it from her, cries a lot, and that she views both Naos grabbing of the bear and her crying as positive, as her fledgling attempts to interact with and elicit sympathy from the other children. Morita-sensei views Naos crying as a sign of her strength rather than weakness and as pro-social because it is a way of revealing herself to her classmates and in this way of showing her desire to amae. Following an idea of Doi Takeo (1971), we see such immature expressions of amae as the building blocks of Japanese social relations, as amae, the desire to be cared for by others, is reciprocally related to omoiyari, the ability and willingness to respond empathetically to the feelings of others. In this paper we also highlight examples of where Morita-sensei and Kaizuka-sensei draw attention to sabishisawhich in English is a combination of sadness and loneliness. Both teachers see sabishisa as a positive emotion, reasoning that expressing loneliness and sadness, like expressing amae, acknowledges ones desire for belonging to a community and invites omoiyari from others. Kaizukas strategy of pushing the two fighting boys to express their regret over their actions by eventually breaking down and crying is one such example of how Japanese teachers use sadness and other expressions of feeling to scaffold childrens social-emotional development. We are not suggesting that these emotions are characteristically Japanese, but rather than among Japanese early childhood educators there are implicit cultural beliefs and practices for helping children learn to express and respond to emotions. In the course of reanalyzing transcripts [of interviews conducted for the Psin3C studies with Japanese educators] we noticed something that we had missed before in comments from an interview with Director Kumagai of Senzan Yochien in Kyoto. As Director Kumagai watches the scene in the Komatsudani video where a group of girls fight over the teddy bear, she comments: Look, there is a gyarari (gallery). Fights are important for the children who are not fighting. Teachers should pay attention to them, and to consider what they are learning. This comment failed to make it into Preschool in Three Cultures Revisited. But as we attended afresh to Director Kumagais words, and especially to her unusual use of the English loan word gyarari, we came to the realization that in our previous analyses of this and other scenes of fighting in Japanese preschool classrooms we had missed something important. In our focus on the children directly involved in the fights (the children doing the pushing, hitting, pinching, crying, tattle-telling, admonishing, and comforting) we had failed to notice the presence of the children on the periphery of these scenes, children who watched the fights without (at least from our perspective) being actively involved. These are the children Kumagai-sensei referred to as a gallery. In the course of shooting and editing the videos and using them as interviewing cues we had watched these fighting scenes literally hundreds of times without noticing the presence of the galleries that formed around the fighters and mediators and without considering what these peripherally participating children might be experiencing, learning, or contributing (Hayashi & Tobin, 2011, 140). In this paper, as well as in our forth coming paper, Reframing a Visual Ethnography of a Japanese Preschool Classroom (Hayashi & Tobin, 2012), we re-analyze the fighting scenes in the Komatusdani and Madoka videos, this time literarily and metaphorically shifting our focus of attention from the children who we first perceived to be the key figures in the fights, to the children on the periphery, whom we had not noticed as participating until Kumagai-sensei pointed them out. We argue in these papers that Japanese educators have implicit cultural beliefs and practices about how children learn from observing other children involved in intense interactions and how these Japanese emic beliefs both extend and challenge Western notions of peripheral participation and observation learning. Emic concepts we discuss in these papers include not just the notion of the gyarari, but also mawari no ko (the children around or surrounding) and seken no me (the eyes of society or what Takie Lebra translates as the generalized audience, 1992). We argue that these and other implicit cultural notions are part of a Japanese educational perspective quite different from more individual-centric Western pedagogical notions that give more attention to each childs development than to the development of the class as a community. Our newest research, which we have just begun, is work we are conducting with a team of Deaf researchers on deaf preschools in Japan, France, and the United States. The method for this research is, once again, video-cued multivocal ethnography. When videotaping a day in a preschool classroom at Meisei Gakuen, a Deaf, signing school in Tokyo, the two of us immediately were struck by similarities between practices at Meisei and those of Komatsudani Hoikuen and Madoka Yochien and other hearing Japanese preschools. The fact that we see deep similarities in the beliefs and practices of the teachers at Meisei and at Komatsudani and Madoka we take as further evidence for our thesis that in Japan (as elsewhere) there are national cultures of teaching and that much of what goes on in preschools reflects what we call implicit cultural beliefs and practices. We call these beliefs and practices implicit because for the most part they are not taught in schools of education, written down in textbooks, or in policy directives. As the first school in Japan that uses Japanese Sign Language as the main language of instruction (along with written Japanese), Meiseis teachers, directors, and board members are blazing a new educational path. Many of Meiseis ideas about the curriculum and how to teach come as much or more from deaf pedagogy than from the world of mainstream Japanese education. Meiseis preschool teachers had more of their professional training in deaf studies than in early childhood education. And yet, having done a lot of previous research in hearing Japanese preschools, we found much about their practices very familiar. As Mika and Satoshi continue their discussion, Chika comes over to Ikeda-sensei, the head teacher of the preschool class, who has been patiently waiting and watching during this whole interaction. Ikeda-sensei explains to Chika that Satoshi has a tendency to dominate conversations and to say too much, not giving others a chance to express themselves. Eventually Satoshi finishes his discussion with Mika and says he needs to apologize to Chika for having pushed her away. But instead of apologizing, he tells her that she shouldnt have interrupted. Our speculation is that he didnt apologize because he believed that his actions were justified and appropriate according to the implicit rules of deaf discourse, which view interrupting a face-to-face conversation between others as rude. Chika responds by explaining that she had only wanted to say one small thing and that he had hurt her feelings. Ikeda-sensei, sitting just a few feet away, waits and watches this whole interaction (mimamoru), nodding in approval as Chika makes her points. Finally, the tug of war begins (and Kurihari-senseis team wins, as Satoshi predicted). During this whole interaction, which lasts about 15 minutes, six or seven other children from the preschool class, who are not directly participating in the discussion, perform the role of what Kumagai-sensei calls the gyarari, and what we would, following anthropological studies of Japan, word call seken no methe eyes of society. We are only at the very beginning stages of this research. The next step will be to return to Meisei to interview Ikeda-sensei and other teachers, administrators, and parents there about the practices seen in the video. In these interviews we will be looking closely for expressions of implicit as well as explicit cultural beliefs about teaching and learning. 1971 The anatomy of dependence. Kodansha International. 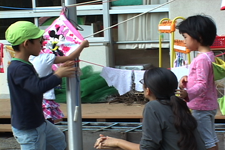 2011 The Japanese Preschools Pedagogy of Peripheral Participation. Ethos, 39, 2, 139-164. Reframing Visual Ethnography of a Japanese Preschool Classroom. Visual Anthropology Review (forthcoming). 2009 The Japanese Preschools Pedagogy of Feeling: Cultural Strategies for Supporting Young Childrens Emotional Development. Ethos, 37, 1, 32-49. 1992 Japanese Patters of Behavior. University of Hawaii Press. 2009 Preschool in Three Cultures Revisited: China, Japan, and the United States. The University of Chicago Press. 1989 Preschool in Three Cultures: Japan, China, and the United States. New Haven, CT: Yale University Press. Akiko Hayashi just completed her Ph.D. in early childhood education at Arizona State University and is now a Post-Doctoral Fellow at the University of Georgia. She is interested in teachers' cultural beliefs and practices, social emotional development in young children, and comparative education, within the context of early childhood education, with a focus on Japan and US-Japan comparisons. Joseph Tobin is a Professor in The Department of Elementary and Social Studies Education at the University of Georgia. His research interests include cross-cultural studies of early childhood education, immigration and education, children and the media, and qualitative research methods. He directed the Children Crossing Borders project and his newest project is a study of Deaf Kindergartens in Japan, France, and the US.